Part of our assignment this week with the Master Key Mastermind was to watch one or more of four movies that speaks to the very life lessons we have been learning these past 12+ weeks. 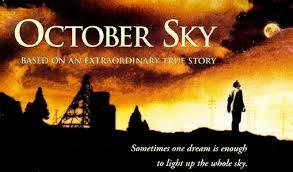 The first of the four movies I watched was October Sky. How inspiring! Young Homer, a high school student in a coal mining town was inspired by the Sputnik rocket he and his town observed on its maiden run. The seed of desire was planted — His dream was big with possibilities and he had the willingness to take extraordinary measures and efforts to see it manifested. As our teachings clearly urge, he established a “mastermind alliance” among his peers and surrounding adults to support and encourage him as well as contribute to the process. His teacher, Miss Riley was extremely instrumental in nurturing his early defined DMP (definite major purpose) until it was strong enough to withstand the usual push back from those with myopic vision. Finally remember, to launch your dream it most likely will required a short term sacrifice for the long term benefit. More specifically, you may need to maintain your “day” job while consistently working on your dream in every waking moment beyond core commitments. Despite nay-sayers including key loved ones, little Homer kept believing, kept learning, kept growing and kept pressing on to ultimate success. It’s a delightful movie to watch and even more inspiring . Check it out! so glad you liked the movie too! I certainly loved it! I haven’t yet watched this one, but you have inspired me to do so by the weekend! Thank you! Glad you were inspired. I trust that after you watched it you were even more so. Keep believing! When you can see greatness in others… it is because it’s already in you! Persistent desire builds confident expectation’s… not to fear failure but to use as a tool to fine-tune our purpose! I love your words of wisdom in your comment. Thanks for sharing your thoughts…come back soon and share more. I really enjoyed reading you post, I also watched the movie, WOW it really reminds of what we are doing these days. I have seen this movie so I was not going to watch it again, however your post has made me realize the “old me” saw the movie and now am inspired to view it again. I am going to be watching it tonight as I will now see it in an entirely new light. Thank you! Glad I inspired you to take another look. I’m sure you will see things you didn’t see before and/or see them in a different light. Kudos! Keep believing. Celeste- Why don’t you just give up…I Can’t! So glad you picked out that exchange in the movie, so very inspiring. Thank you! Thanks for your comment…glad you were inspired.